The primary method of navigation underwater is simply to know where you are going and where you have come from. This allows you to retrace your route if need be. You should always take note of your surroundings and look at the view behind you so that you know what the return journey will look like. If you keep the reef or wreck on your left on the outward trip, you just keep it on your right for the return journey. But you will still need to know what the terrain looks like where you first entered if you are to ascend in the same place. It’s a good idea to make a mental note of prominent parts of the topography or wreck site. Getting lost underwater happens a lot less often than you may think. This is because divers have an important source of information about their whereabouts -their depth. Divers in the ocean navigate in a three-dimensional space, and if you know where you are in relation to the surface you can always reach it. If the seabed is getting shallower, you are probably heading toward a shore or the top of a reef. The ripple marks in a sandy seabed reveal the angle at which the waves are hitting the beach. You should make a note of where the sun is. Its light may be refracted through the water, but it is usually possible to tell if it is behind you or to one side. Compasses are useful navigational tools, but you need to be confident in your ability to read and hold a compass properly. A compass needle always swings to the north if it is free to do so. You must be careful to hold the compass level so that the needle can rotate freely. A compass is magnetic, so large areas of ferrous metal will affect it. For this reason, a compass is useless on a steel wreck. It may also be affected near a steel tank. A simple underwater magnetic compass is a useful tool as long as you are aware of its limitations. There are also some sophisticated electronic compasses available. Competent use of a compass should allow you to swim away from a point and return to it with relative ease. One method you can use to make sure you end up where you started is to divide your journey into three segments of equal length. By turning through 90 degrees at the end of each segment, you should end up near to where you started. 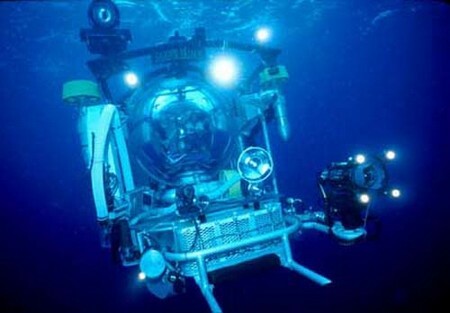 To navigate around a wreck, especially in poor visibility, you can use the line you used to descend to reach the wreck. Take a line and winder reel and clip the line of the reel to the line you descended. You then let it unwind, tying it off occasionally to handy points on the wreck. When it’s time to return, you just wind the line back in until you reach what has now become your line up to the surface.